Michael (Mike) Makoto Honda was a Democratic member of the United States House of Representatives, representing the 17th district of California. Mike Honda was born in California, but spent his early childhood with family in an internment camp in Colorado during World War II. Mike’s father served in the Military Intelligence Service, while his mother, who is still living, served as a fulltime homemaker. His family returned to California in 1953, becoming strawberry sharecroppers in San José's Blossom Valley. In 1965, Honda "answered President John F. Kennedy's call for volunteer service, enrolled in the Peace Corps for two years in El Salvador and returned fluent in Spanish and with a passion for teaching". 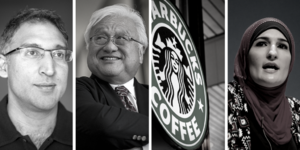 Mike Honda earned Bachelor's degrees in Biological Sciences and Spanish and a Master's degree in Education from San José State University. In his career as an educator, Mike was a science teacher, served as a principal at two public schools, and conducted educational research at Stanford University. In 1971, Honda was appointed by then-Mayor Norman Mineta to San Jose's Planning Commission. In 1981, Mike won his first election, gaining a seat on the San José Unified School Board. In 1990, Mike was elected to the Santa Clara County Board of Supervisors, where he led efforts to acquire and preserve open space in the county. Mike Honda served in the California State Assembly from 1996 to 2000. In 2000, Mike was elected to the U.S. House of Representatives and serves on the Appropriations Committee, with postings on Commerce, Justice, and Science, and Legislative Branch Subcommittees. As an Appropriator, Mike focuses on directing funding towards affordable healthcare, educational programs, worker training, port and border security, law enforcement and the safety of our neighborhoods, health care for our veterans and recovery from natural disasters. Honda is currently the Chairman Emeritus of the Congressional Asian Pacific American Caucus (CAPAC) after spending seven years as Chairman. He continues his past work of coordinating with his colleagues in the Congressional Black Caucus and the Congressional Hispanic Caucuses to champion the causes of under-represented communities by promoting social justice, racial tolerance, civil rights and voting rights. Additionally, as Co-Chair of the House LGBT Caucus, Mike Honda authored immigration legislation to reunite all families, regardless of orientation. In the 112th Congress, Mike was reappointed to House Democratic Senior Whip by then House Minority Whip Steny Hoyer (D-MD). The Council for a Livable World, founded in 1962 by long-time socialist activist and alleged Soviet agent, Leo Szilard, is a non-profit advocacy organization that seeks to "reduce the danger of nuclear weapons and increase national security", primarily through supporting progressive, congressional candidates who support their policies. The Council supported Michael Honda in his successful House of Representatives run as candidate for California. In a report given to to the National Committee of the Communist Party USA and dated September 26 2001, California District Communist Party USA - Northern Region chair Juan Lopez, wrote extensively on Honda. California was a big bust for Bush and the Republicans. Joining with Los Angeles and other Southern California areas, the greater Bay Area counties, where the population is concentrated in Northern California and the labor movement is strongest, helped give Gore a big win in the state. With the exception of one county with 50 percent, Gore took the greater Bay Area by margins of 60 to 76 percent depending on the county, helping offset more conservative areas of the state. Time won't permit me to elaborate. But, even with all these victories in California, there is both the need and the potential to broaden, extend and deepen this winning electoral coalition in the post-election period -- beginning with the fight to keep Bush and the rightwing from stealing the elections. Labor organized and mobilized like I've never seen, in some areas working more closely with its allies, especially among African Americans and Mexican Americans. Along with women voters, labor and African Americans and Latinos were the core of the electoral coalition that dealt Bush and the Republicans a devastating defeat in California. One of those places was the 15th congressional seat in the San Jose-Silicon Valley area. The Republican candidate tried to tailor his campaign to the area. Without veering from the Republican agenda on basic economic issues, he emphasized his 'independence' from the Republican Party leadership, favored a woman's right to choose and bragged about his environmental record. I want to cite one example. On the Saturday before the elections, our paper ran a very good article on the congressional races, highlighting Mike Honda among others, with a big picture of him. I asked if it was OK for me to pass the paper out, outside by the front door as the volunteers came streaming back for lunch. I was told, no!...Better yet: put copies on the tables where the workers would be having lunch and pass them out inside the campaign headquarters to those hanging around. A 2002 report by Joelle Fishman, Chair, Political Action Committee, Communist Party USA to the Party's National Board, called for communist support for two California Congressional candidates-Michael Honda and Barbara Lee. Certainly, we would not be making our special contribution to this crucial election if we were to approach our task in simply a narrow, immediate way. This gigantic election battle must be put into the broader context of the fight for an expansion of democratic rights, voter rights and voter participation. It must be put into the context of building political independence of labor and allies. In addition to union-based get-out-the-vote drives, what does political independence of labor and allies encompass? Perhaps in the first place, it means adding more Mike Honda's to Congress - electing more union leaders and activists to public office. Cindy Chavez, a former South Bay Labor Council staff director, and 1999 Communist Party USA honoree, was elected to the San Jose City Council in 1998 and in 2006, served as vice mayor. Besides the Labor Council and many labor, community, environmental and political organizations, she was endorsed by U.S. Representatives Anna Eshoo, Mike Honda and Zoe Lofgren; Los Angeles Mayor Antonio Villaraigosa; several former San Jose mayors; and seven current city councilmembers. Though she was backed by labor and opposed by the Chamber of Commerce, Chavez emphasized bringing all segments of the community together to solve problems. As an example, she cited her leadership role on the council for the Children’s Health Initiative, which brings together public and private funding to provide health coverage to most uninsured children in Santa Clara County. One of my favorite elected leaders is Mike Honda, a congressman in California. I would do anything for this guy: He takes chances, he takes risk. He always sticks to his progressive values. Even when he is a minority, he never sways from his values. In the house of representative, Wednesday, June 4, 2003, the Santa Clara County Congressional delegation - Anna Eshoo, Mike Honda and Zoe Lofgren, read a tribute into the Congressional Record to Congressional Record to Amy Dean, Chief Executive Officer of the South Bay AFL-CIO Labor Council, who was leaving the bay Area to return to her native Chicago. Through Amy Dean's leadership, the South Bay AFL-CIO Labor Council has been extremely successful in working for living wage contracts for city workers, affordable housing requirements in new developments, and health insurance for every child in Santa Clara County. Amy Dean has been a tireless and passionate advocate for social justice and has helped to strengthen the labor movement, bringing dignity and hope to countless families, whether they are union or non-union workers. Amy Dean was the youngest person in the country to lead a large metropolitan labor council and the first woman to head a labor council as large as the South Bay AFL-CIO Labor Council. Michael Honda signed the letter. The Day of Remembrance was commemorated 2003 in Little Tokyo with a program entitled “Race Prejudice, War Hysteria, Failure of Political Leadership: Then & Now,” presented by Nikkei for Civil Rights & Redress (NCRR), Japanese American Citizens League/Pacific Southwest District (JACL), and the Japanese American National Museum (JANM), at JANM’s George & Sakaye Aratani Central Hall. The NCRR Fighting Spirit Award was given to Janice Yen, community redress activist and a founding member of NCRR, and Los Angeles Human Relations Commission Executive Director Robin Toma was honored with the JACL Community Achievement Award. Rep. Mike Honda (D-San Jose) delivered the keynote address at the event emphasizing on importance of passing on the story of the Japanese American internment experiences to the future generations and criticizing the anti-Muslim American hysteria after the 9/11. “Today, we are here at this museum because it is a depository of all the information. We have to ask ourselves why we are here. For me the answer is to pass on the information. Guest speakers included Congressman Xavier Becerra and Omar Ricci of Muslim Public Affairs Council (MPAC), touched on recent comments by Rep. Howard Coble and comparing the Nikkei World War ll experience with what many of the Muslim Americans have been going through since 9/11. Becerra disagreed with Coble’s comments declaring that what happened 60 years ago to Japanese Americans was wrong.” However, he claimed that Coble would listen and acknowledge injustice of the internment if he had a right information. “I won’t give up on anyone just like Issei who believed in hope, justice and finally got a citizenship after all those years,” Becerra stated. Flanked by former internees and leaders of civil rights organizations, Rep. Mike Honda (D-San Jose) called for the Republican Party to hold North Carolina Rep. Howard Coble responsible for comments he made endorsing the internment of Japanese Americans during World War II. Joining Honda at the press conference, were Kei Nagao, Nikkei Coalition for Redress and Reparations; Ken Inouye, Pacific Southwest District Japanese American Citizens League; Salam Al-Marayati, executive director, Muslim Public Affairs Council; Bill Watanabe, Little Tokyo Service Center; Stacy Toda, Organization of Chinese Americans; Guy Aoki, Media Action Network for Asian Americans; Frank Emi, wartime draft resister; Jim Matsuoka, a former internee at Manzanar; as well as representatives from the Japanese American Bar Association, Japanese American Cultural Community Center and Visual Communications. The groups reiterated calls for Coble to step down as chair of the House subcommittee and expressed concerns that his statements reflected the eroding of civil liberties in American society. The San Jose congressman declared that the issue has underscored the ne-cessity that Japanese Americans continue to speak out on the internment. “The reason why it is so important that Japanese Americans, Nikkeis especially, speak out today and speak out tomorrow and into the future is that we have to have this continuous learn-ing mode to make sure the other policy makers and other members of our society continue to learn what it is that we suffered, what lessons that were learned through our efforts in reparations, and the lessons we learned about the importance of the Constitution,” Honda said. As of February 20 2009 Michael Honda was listed as a member of the Congressional Progressive Caucus. In January 2015, Michael Honda was listed as a Vice Chair of the Congressional Progressive Caucus. Reps. Emanuel Cleaver (D-MO), Marcia L. Fudge (D-OH), Laura Richardson (D-CA), Bobby Rush (D-IL), Melvin Luther Watt (D-CA), and Barbara Lee. "Also particapating were Patrice Willougby, executive assistant to the Congressional Black Caucus, and Eulada Watt, wife of Congressman Mel Watt". Lee says she wanted to influence President Barack Obama prior to the upcoming Summit of the Americas in Trinadad and Tobago. Prior to the trip, Lee told her hometown Oakland Tribune newspaper that the US had to open up to Cuba, but did not demand that the Cuban government open up; she blasted US policy as "based on antiquated Cold War-era thinking." She could have used those words to describe her own views. Michael Honda, from California, also accompanied the delegation, as did Patrice Willoughby, executive assistant of the Congressional Black Caucus, plus four military personnel from the Congressional Liaison Office under the orders of Lieutenant Colonel Daniel Wolf. On Dec. 22, 2009, thirty-three U.S. Representatives wrote to Secretary of State Hillary Clinton, calling on her to request that the Israeli Government end the ban on student travel from Gaza to the West Bank. Michael Honda was one of the signatories of the letter. The entire letter together with a complete list of signatories can be read by clicking here. On Jan. 27, 2010, U.S. Representatives Keith Ellison and Jim McDermott led 52 other members of Congress in signing a letter addressed to President Barack Obama, calling for him to use diplomatic pressure to resolve the blockade affecting Gaza. Michael Honda was one of the signatories of the letter. The entire letter together with a complete list of signatories can be read by clicking here. In 2010 the Asian American Action Fund endorsed Ami Bera and Mike Honda for US Congress in the June 8 California primary election. In the 2014 election, Michael Honda was supported by the Asian American Action Fund. Rep. Honda sent Michael Shank, to Venezuela for 3 days in February 2010. The trip was courtesy of a $2,219.70 grant from the Institute for Policy Studies connected Center for Democracy in the Americas... "A fact-finding trip in Venzuela and other Latin American countries with the mission of fostering dialogue and improving U.S. policy and bilateral relations" . Rep. Honda traveled to Honduras and El Salvador for 3 days in May/June 2010. The trip was courtesy of a $4,107.39 grant from the Institute for Policy Studies connected Center for Democracy in the Americas... "Assess the situation in Honduras and El Salvador and current U.S. policy implications in the countries" . One early morning fall 2010, professor Masao Suzuki was in the driveway of his west San Jose home. As he tells it, his daughter was in the car, waiting to be driven to Prospect High School. Suzuki had just finished loading the things he’d need that day to teach economics classes at Skyline College into his trunk when a man walked up to him. Suzuki, a longtime local political activist, says the man tried to question him, but he refused. He says the man told him he would have to instead question his neighbors and co-workers. “I just said, ‘I don’t want to talk to you,” Suzuki recalls. Although he never heard from him again, there’s no doubt in Suzuki’s mind that the young dark-suited man was an FBI agent. Suzuki believes the visit was part of an FBI investigation seeking to convict him and other anti-war activists of terrorist activities under the PATRIOT Act. He believes this because on that same day—Sept. 24, 2010—the FBI raided the Chicago and Minneapolis homes of several of his colleagues—activists who’d organized protests at the 2008 Republican National Convention. In those raids, the FBI seized computers, cell phones and documents, and served federal grand jury subpoenas to 14 people. In other parts of the country that day, at least 20 others were questioned. Last month new subpoenas were served on another group of activists. A total of 23 people have been ordered to appear at a Chicago Grand Jury on Jan. 25. The search warrants issued by the U.S. District Court on Sept. 23 indicate that the FBI was looking for evidence related to a law prohibiting “material support to designated foreign terrorist organizations.” Suzuki is named on the search warrants issued to the Twin Cities Anti-War Committee along with others who were subpoenaed. Suzuki is a 20-year member of San Jose’s Nihonmachi Outreach Committee (NOC), whose mission is “educating the public about the incarceration of Japanese Americans during World War II.” In 2008, representing NOC, Suzuki joined a coalition of peace organizations who demonstrated at the September 2008 Republican National Convention in St. Paul, Minn.
A flier promoting the protest, which proclaims “U.S. Out of Iraq Now!,” names Suzuki as the contact and includes his cell phone number. This flier lists the Twin Cities Anti-War Committee and dozens of other participating organizations including CODEPINK, Veterans for Peace, the War Resisters League and dozens of Midwestern student groups, labor unions and peace centers. Following the alleged encounter in his driveway last September, Suzuki says, he was shaken. He soon got wind of the FBI’s activities in Chicago and St. Paul. He says he warned his neighbors, his students and the vice president of his union—the [[A[merican Federation of Teachers]]—that the FBI might be calling on them. He also contacted an attorney, Dan Mayfield of San Jose. Mayfield is a member of the National Lawyers Guild, a civil rights advocacy group that, along with the ACLU, is closely following this grand jury and the FBI’s activities. He says Patrick Fitzgerald, a high-profile U.S. attorney for northern Illinois, is taking the PATRIOT Act’s definition of “terrorist act” and a change in the definition of “material aid” from a recent Supreme Court case and putting them together to intimidate people and organizations. On Dec. 2, Suzuki and representatives from the South Bay Labor Council, American Federation of Teachers, Council on American-Islamic Relations and the San Jose Peace Center met with Rep. Mike Honda’s aides. They had Honda send a letter of inquiry to U.S. Attorney General Eric Holder. Honda’s office says it’s still waiting to hear back from Holder. Mayfield says that since Sept. 24 there’s been a lot of push-back to the FBI’s moves. The National Lawyers Guild, the ACLU and hundreds of labor unions, state and federal legislators, and human rights groups have asked Holder to stop this grand jury. A new national organization, the Committee to Stop FBI Repression, is organizing demonstrations in 20 U.S. cities on Jan. 25. Suzuki and Mayfield have organized an affiliate, the South Bay Committee Against Political Repression, which is holding teach-ins and a rally on Jan. 25 from 4 to 6 pm at the Martin Luther King Jr. Library at Fourth and San Fernando streets in San Jose. The 30th annual San Jose Day of Remembrance was held at San Jose Buddhist Church Betsuin on February 14, 2010. Emcee Will Kaku pointed out that the Civil Liberties Act of 1988 attributed the incarceration of Japanese Americans to "prejudice, war hysteria, and the failure of political leadership." "We need to hold all political leadership accountable for defending our civil liberties," he said. "Let us not forget the words of Dr. Martin Luther King, Jr., who said 'injustice anywhere is a threat to justice everywhere.' There is much unfinished business and work we have to do in this community." Gary Jio delivered the NOC keynote address, highlighting his speech with excerpts from songs from the 60's to the present. His message was twofold: Day of Remembrance was a huge influence during the redress movement, keeping redress and reparations for Japanese Americans in the public mind. To keep Day of Remembrance relevant today, it must tell the stories of the camps vividly enough to be felt personally, and relate to current civil liberties issues, such as Japanese Latin American redress and reparations, equality for members of the Muslim American and LGBT communities. Grace Shimizu of Campaign for Justice described the hardships her father suffered when he was abducted from his home in Peru, to forced labor in a prison camp in the Panama Canal Zone, and incarceration in the Department of Justice camp in Crystal City, Texas. She urged support for H.R. 42/S. 69 that will commission an investigation into the Japanese Latin American experience during World War II and make recommendations it deems appropriate. The traditional candle lighting ceremony, accompanied by shakuhachi master Kanow Matsueda, was narrated by San Jose JACL President Leon Kimura and NOC Chair Reiko Nakayama. As they called the names of the camps, the Shibayama Family, Art, Betty, Brian and Becki, lit the candles for each of the ten camps. The following candlelight procession through the streets of Japantown was led by banner bearers from NOC and Silicon Valley JACL. Two cultural performances rounded out the program: Kanow Matsueda, shakuhachi, and Julie Masazuki Sumida, koto, played pieces by classical and modern composers. Congressman Mike Honda, a long-time supporter of NOC, urged the audience to take action on H.R. 42/S. 69 by contacting Congress members who are inclined to vote 'no' or are fence-sitting. More than 300 people packed the San Jose Buddhist Church hall on Feb. 20 2011, to attend the 31st annual Day of Remembrance event in San Jose. This event commemorates Executive Order 9066 that was issued on Feb. 19, 1942 and which led to the incarceration of 120,000 Japanese Americans in U.S. concentration camps during World War II. The theme of the event was “Fighting Against Fear” which made connections the Japanese American experience during WWII and the attacks on Arab Americans and American Muslims today. The San Jose Day of Remembrance was organized by the Nihonmachi Outreach Committee (NOC), a grassroots community organization that was formed in the late 1970s out of concerns about the impact of corporate redevelopment on historic Japanese American communities. The event was emceed by NOC member Masao Suzuki, who pointed out the forces of “racism, war hysteria, and political misleadership” that led to the World War II concentration camps for Japanese Americans were also at work today in attacks on Arab Americans and American Muslims. Jimi Yamaichi, who was sent to the concentration camp at Tule Lake, California, told the audience about his fight to join the local carpenters union, which excluded Japanese and other Asians before World War II. Jimi Yamaichi was also among 26 young men at Tule Lake who refused to be drafted into the U.S. military along with hundreds of others at other camps. The special guest speaker for the evening was Zahra Billoo, the executive director of the San Francisco Bay Area chapter of the CAIR, the Council on American Islamic Relations. Billoo commented on CAIR courage award that had be given to Mr. Yamaichi, and in turn was thankedd by the emcee, Masao Suzuki, for her work on his behalf after he had been questioned by the FBI in connection with the Federal Grand Jury targeting Midwest anti-war and international solidarity activists. Yasmine Vanya of the South Bay Islamic Association also spoke and thankedd the Japanese American community for their solidarity and support in the days following Sept. 11, 2001. After the procession there was a short speech by Karen Korematsu, the daughter of Fred Korematsu. Fred Korematsu was one of three Japanese Americans who fought the concentration camps through the courts, eventually taking the case to the U.S. Supreme Court. While the 1944 Supreme Court ruled that the camps were legal because national security outweighed individual rights and allowed racial discrimination, this was overturned in 1983 when it was shown that the U.S. government deliberately lied to win the case. The state of California just celebrated its first “Fred Korematsu Day” on his birthday, Jan. 30. The last speaker was Congressman Mike Honda, who represents the 15th district in San Jose. He spoke about how fear led to Japan bashing in the 1980s and compared this to the rising tensions with China today. At the end of the program the Suzuki, reminded the audience about the continuing struggle of Japanese Latin Americans. The U.S. government held more than 2000 Japanese civilians from Latin America in Department of Justice prison camps at Crystal City, Texas and other sites to be used as prisoner of war exchanges. Japanese Latin Americans were excluded from the 1986 and 1988 redress (apology) and reparations (monetary compensation) awarded to almost all Japanese Americans held in concentration camps on the grounds that they “entered the country illegally” (true enough, since they were rounded up at the behest of U.S. government and brought to the United States at gunpoint). He urged the audience to support the Campaign For Justice (CFJ) efforts to establish an official commission to report on Japanese Latin Americans. In addition to the record turnout, the audience had large number of young people from local colleges and a good turnout from the local peace and international solidarity movements and the American Muslim community. Local state assemblyman Paul Fong also came with a proclamation from the California state assembly commending the Day of Remembrance event. Another highlight of the program was the proclamation presented by the mayor of East Palo Alto, Reuban Abrica, to the Nihonmachi Outreach Committee (NOC), which has organized Day of Remembrance events for 32 years in San José. The proclamation was accepted by NOC’s chairperson, Reiko Nakayama. The Day of Remembrance included a performance by the San José Taiko (Japanese folk drums), including a piece entitled “Day of Remembrance” to commemorate the event. Also speaking were the local Japanese American Congressman Mike Honda, and representatives of the Buddhist Church, the Wesley United Methodist Church and the South Bay Islamic Association. On Feb. 16, 2014, more than 250 people gathered at the Buddhist Church hall in San José Japantown to commemorate the 34th annual Day of Remembrance. Days of Remembrance events are held in Japanese American communities to commemorate Executive Order 9066, issued by President Franklin D. Roosevelt on Feb. 19, 1942, which led to the incarceration of 120,000 Japanese Americans in concentration camps during World War II. The San José event was organized by the Nihonmachi Outreach Committee (NOC). The event was emceed by Reiko Nakayama of NOC, and began with an opening aspiration by Reverend Hajime Yamamoto of the Wesley United Methodist Church. The remembrance speech was given by Joe Yasutake of the Japanese American Museum of San Jose. The next speaker was Sara Jaka, of the South Bay Islamic Association, which is located a few blocks from San Jose Japantown. She said that coming to the Day of Remembrance event made her feel both “fearful and hopeful,” hearing how actions then and now are driven by racial prejudice, but also seeing people coming together in solidarity. The next speaker was Dale Minami, who was the lead attorney of the legal team that challenged Korematsu v. United States in court in 1983. Mainly made up of young Asian American attorneys, the legal team was able to show that there were no arrests of Japanese Americans for espionage. Further, they showed how the government prosecutors altered, suppressed and destroyed evidence, including reports from military intelligence that showed that there was no need for the camps. Another highlight of the program was an award presented by the Nihonmachi Outreach Committee, to local congressperson Mike Honda, who was an annual speaker at the Day of Remembrance events. The Day of Remembrance included a performance by the San José Taiko )Japanese folk drums) and candlelight procession through Japantown. The evening ended with a closing meditation by Rinban Ken Fujimoto of the Buddhist Church. APALA was doubly represented at the NCAPA Immigration Roundtable in 2012, where Caroline Fan and Seattle chapter member Yuki Suren, an undocumented student, spoke movingly about the need for immigration reform and the DREAM Act, recognizing that about 10 percent of undocumented students are APA. Caroline said, "America was built out of the dreams and sweat of immigrant workers, and if we are going to be a prosperous, future-facing country, we need to include our most talented young people - regardless of immigration status." Yuki shared her own hopes and experiences: "Passing the Dream Act will help me and many other good hard working people who just simply want to survive. It will help me to fulfill my dreams, serve my community and contribute to this nation which I consider my home. Please put yourself in my position, and do not punish me for the sacrifice that my parents made for a better life for me. Our immigration system especially victimizes immigrants' children who had no say in coming here." January 23, 2012, U.S. Senator Kirsten Gillibrand and Representatives Nydia Velázquez, Judy Chu, and Mike Honda, called on the U.S. Army to provide a comprehensive review on how the department tracks its hazing and harassment incidents and implements anti-hazing training. The urging by the four members of Congress comes after Army investigators found that a New York resident, Private Danny Chen, was subjected to daily race-based hazing and physical abuse by members of his platoon in the lead-up to his death. The lawmakers also requested details on what current measures are in place for soldiers in remote bases to report hazing incidents when their entire chain of command is implicated. Last month, Senator Gillibrand called on the Defense Department for a system-wide review of bullying and mistreatment. The Senator asked for a Department-wide review because of the case of Marine Pvt. Hamson McPherson, Jr., a Staten Island Marine who committed suicide, allegedly due to hazing. 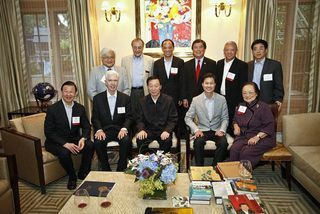 Luo Zhijun, Governor and Party Secretary for Jiangsu Province, and his economic development delegation were hosted at a dinner in the home of H&Q Asia Pacific Chairman and Founder Ta-lin Hsu on July 17, 2011, in Atherton, California. A number of Committee of 100 members and members of Congress, and other special guests, attended. The delegation, representing the one of the wealthiest Chinese provinces, included members of the Jiangsu government as well as Jiangsu-based entrepreneurs including the CEO of the solar energy company Suntech, Shi Zhengrong. Governor Luo gave a brief talk introducing Jiangsu’s economic advantages, which was extensively covered in the Chinese press. Hsu, along with members David Chang and Roger Wang, also assisted the delegation by introducing the delegation to Silicon Valley companies. Attending the dinner were U.S. Representatives Judy Chu, Mike Honda and David Wu, as well as former California Governor Gray Davis, Committee Chair Dominic Ng, C-100 members Pehong Chen, Wu-Fu Chen, Andrew Cherng, John Chiang, Weili Dai, Kenneth Fong, Doreen Woo Ho, George Koo, Stewart Kwoh, Li Lu, Dennis Wu, Jay Xu, Linda Tsao Yang, and Executive Director Angie Tang and Program Associate Alice Lin. U.S. Rep. Judy Chu (CA-32), Chairwoman of the Congressional Asian Pacific American Caucus led the first ever CAPAC Congressional delegation to the People’s Republic of China, in September 2011. The primary purpose of the delegation was to promote U.S. exports and improve the U.S.-China relationship. Chairwoman Chu was accompanied by CAPAC Executive Board Members Rep. Mike Honda (CA-15) and Rep. Eni Faleomavaega (AS). On February 14, 2012 Committee of 100 hosted a “Year of the Dragon” Lunar New Year Reception in Washington D.C. in the Gold Room of the Rayburn House Office Building. The guests were Asian Pacific American leaders, Members of Congress and Congressional staffers, media representatives, and other honored guests. Committee of 100 Chairman Dominic Ng, Representative Judy Chu (CA-32), Representative Rick Larsen (WA-02) and Senator Daniel Inouye (HI) each addressed the approximately 120 guests. The Committee paid tribute to two members of the Committee’s Advisory Council, Irene Hirano and the Honorable J. Stapleton Roy, who were thankedd for their exemplary service and long-time support. Other distinguished guests included: Representative Mike Honda (CA-15); Kenneth G. Lieberthal, Director of the John L. Thornton China Center of the Brookings Institution; Konrad Ng, Director of the Smithsonian Asian Pacific American Program; Kin Moy, Deputy Assistant Secretary for East Asian and Pacific Affairs; C.H. Tung, founding Chairman of the China-United States Exchange Foundation; Steve Orlins, President of the National Committee on U.S.-China Relations; and Eugene Robinson, Columnist and Associate Editor of The Washington Post and 2011 alumnus of the C-100 Journalist Delegation Program. Added Honda, "This is what I heard: class warfare. In America every worker deserves a good job. Strength in numbers is what's going to make the changes in this country." Members of the Host Committee included Mike Honda. The Santa Clara County Deferred Action Network hosted a news conference followed by informational sessions and application guidance. Representative Mike Honda will be in attendance. August 15th: at the Catholic Charities of Santa Clara County Headquarters in San Jose, CA. Contact Mark Nakamoto. Rep. Mike Honda wrote an article, with Ami Carpenter, an assistant professor at the Joan B. Kroc School of Peace Studies at University of San Diego, for The Huffington Post - "What America Can Learn From El Salvador in Ending Gang Violence about El Salvador" in advance of an Institute for Policy Studies-supported event, Wednesday January 13, 2013: "The Obama administration should take a cue from El Salvador, which has adopted a far less confrontational approach to gangs, and is seeing a drop in gang violence as a result.Both of us have worked and traveled extensively in Central America -- El Salvador in particular, which has its own MS-13. " The U.S. -- and gang-plagued Mexico -- should heed the progress made in El Salvador and recognize that the standard methods to end violence aren't working. Creative, innovative solutions are needed. This Salvadoran example is one that should be tried, showing that everyone from the community to local elected officials to law enforcement needs to be brought in to truly end violence on a large scale. The truce established in El Salvador may be unusual, but it is most certainly benefiting the people of that nation, and may serve as an interim solution to a very real and dangerous epidemic. The IPS supported function was held on January 16. at an IPS linked venue Busboys & Poets, 1025 5th Street NW, Washington, DC. Congressional endorsers of the proposal included Mike Honda. In 2013 Progressive Democrats of America assigned activists to deliver their material to almost every US Congressman and Senator, Tom McCarter was assigned as the contact for Rep. Honda. In June it was Yvonne Shevnin, Al Lampell, and Louise Lynch. Proud to join CA Attorney General Kamala Harris in standing strong with Congressman Mike Honda as he stands for reelection — with Shari Rubin-Rick, Sophia Yen and Aimee Allison at Pacific Heights Neighborhood. Alaa Aissi Finance Intern, Mike Honda for Congress. Jan 2016 – Nov 2016. According to Jane Yoo, NAKASEC, the Korean American Resource and Cultural Center in Chicago and the Korean Resource Center in Los Angeles participated in the April 10th 2013 “Time Is Now” rally for citizenship and immigration reform. Thousands of immigrants and supporters from across the country gathered to call on Congress for a swift introduction of a comprehensive immigration reform bill. Among the participants was 17 year old Faustin Combe, a FYSH and KRCC member from Chicago who shared her painful story of being separated from her father and brother who are currently in the Philippines. Joining her was HyunKyu Lee, a recent DACA recipient, undocumented youth and organizer with KRC who also spoke in Asian American and Pacific Islander press conference with the National Council of Asian Pacific Americans and Senator Mazie Hirono and Reps. Judy Chu Congressman Mike Honda. In the morning, NAKASEC participants also delivered 1,267 signatures in support of family unity to offices of the “Gang of 8” Senators, as well as to Senator Mark Kirk (R-IL), Reps. Ed Royce (R-CA), John Campbell (R-CA) and Gerry Connolly (D-VA). Mike Honda claims to be a friend of Marxist Eliseo Medina. Earlier this month on the National Mall, five courageous individuals were huddled in a tent fasting from food and drink to call attention to the urgent need for immigration reform. These advocates joined together to push forward their effort "Fast for Families: A Call for Immigration Reform and Citizenship," which is drawing nationwide attention. I was honored to meet with these fasters, and was quite moved to hear their personal stories. One of them, my friend and SEIU Secretary-Treasurer Eliseo Medina, said, "I know that going without food will not be easy and I know that I will suffer physical hunger. But there is a deeper hunger within me, a hunger for an end to a system that creates such misery among those who come here to escape poverty and violence in search of the American dream." In 2014 longtime Congressman Mike Honda was challenged by Ro Khanna, a patent attorney and former Commerce Department official in the Obama administration. The Democratic Party, trade unions, and groups including MoveOn.org and the Progressive Change Campaign Committee backed Honda. A range of Silicon Valley corporate moguls, including leaders of Yahoo, Google, Facebook and PayPal, supported Khanna. Honda won by a narrow 4 percent. With Special Guests: Rep. Yvette Clarke, Rep. Joseph Crowley, Rep. Steve Israel, Rep. Grace Meng, Rep. Jerry Nadler, Rep. Charles B. Rangel Thursday, October 16, 2014. At the Home of Julie Azuma. One of the Peace Action West team who campaigned for Honda was Eric See, of the Freedom Road Socialist Organization. In 2014 Progressive Change Campaign Committee helped 5 candidates from the "Elizabeth Warren wing" of American politics including Ruben Gallego (AZ-7), Brian Schatz (HI-Sen), Bonnie Watson Coleman (NJ-12), Mike Honda (CA-17), and Pat Murphy (IA-1) defeat more conservative opponents in tough 2014 primary battles. Rep. Honda has been a strong advocate of pro-Israel, pro-peace initiatives in Congress. The Alliance for Retired Americans Political Action Fund endorsed Michael Honda in 2012, 2014. In 2015, in the House, the Democratic recipients of Iranian American Political Action Committee money came out for the Iran nuclear deal. Mike Honda, one of the biggest beneficiaries of the Iran Lobby backed the deal, As did Andre Carson, Gerry Connolly, Donna Edwards and Jackie Speier. Cogressional candidate Michael Honda received money from the Iranian American Political Action Committee during the 2016, 2014, 2012, 2010, 2008, 2006 election cycles. "American Muslim Women: Building Alliances, Upholding Democracy and Defending Civil Rights" was the theme of 32nd annual convention of the United Muslims of America (UMA). The convention, held on February 23, 2013, at the Chandni Restaurant, in Fremont/Newark, drew large crowd from different ethnic and faith groups. The UMA is perhaps the first American Muslim organization which acknowledged and honored the contributions of Muslim women, particularly in the post-9/11 America> when the seven-million strong Muslim American community became target of institutionalized profiling, bigotry, discrimination and hate. Four prominent women activists of California, Feriall Masry (Democrat candidate for California State Assembly in 2010), Samina Sundas (Founding Executive Director of American Muslim Voice), Syeda Reshma Inamdar (Director of the League of Women Voters of California), Ameena Jindali (Islamic Networks Group-ING) and Safaa Ibrahim (President of CAIR-SFBA) shared their experience of civic and political activism. Congressman Mike Honda was the keynote speaker. He is a staunch supporter of Muslim cause. In November 2010, Mike Honda introduced a legislation recognizing the cultural and religious significance of Eid al-Adha. Sabahat Rafiq Sherwani, a civic activist and an the ING board member, was the MC of the program. The program began with the recitation of the Holy Quran by Iman Jandali daughter of Amena Jandali of the Islamic Networks Group. November 17, 2015, Congressional Asian Pacific American Caucus (CAPAC) Chair Rep. Judy Chu (CA-27) and CAPAC Members Rep. Ted Lieu (CA-33), Rep. Grace Meng (NY-06), and Rep. Michael Honda (CA-17) held a press conference to call on the Department of Justice (DOJ) to investigate the recent cases against Chinese American scientists who were wrongfully suspected of economic espionage. They were joined by Sherry Chen, a U.S. citizen and employee of the National Weather Service in Ohio, as well as Dr. Xiaoxing Xi, a U.S. citizen and Interim Chair of the Physics Department at Temple University. Both Ms. Chen and Dr. Xi were arrested and indicted for various charges and suspected of economic espionage, only to have all charges against them later dropped. The press conference comes one day before a CAPAC meeting with Attorney General Loretta Lynch. Former US Congressman Mike Honda (right) and Russell Lowe, the Secretary General of the Education for Social Justice Foundation, spoke about their efforts to publicize the comfort women issue in the United States during a visit to the Hankyoreh’s office in the Gongdeok neighborhood of Seoul on Oct. 15 2017. “I think the Abe administration’s policies and Abe’s remarks themselves are evidence of anti-intellectualism. They say there’s no [corroborating] evidence, but since there are obviously documents showing that the Japanese government systematically mobilized and kidnapped women, the Japanese government ought to take responsibility. That’s why the Kono Statement was released. It’s not so much that there’s insufficient evidence as that there’s a lack of moral leadership in the current Japanese government,” said former US Congressman Michael Honda, 76. Honda dismisses as “nonsense” the claims of Japanese Prime Minister Shinzo Abe and the Japanese government that there was nothing compulsory about the mobilization of the comfort women for the Japanese Imperial army. “California is the first state in the US to include the comfort women issue in school curriculum, but classroom teachers are having quite a hard time because they don’t have any syllabuses or lesson plans. We have currently tested lecture material that we’ve developed,” Honda said. The development of these lecture materials is being handled by Education for Social Justice Foundation (ESJF), which works closely and successfully with San Francisco Unified School District. to development of these lesson plans . ESJF works with a social organization called the Comfort Women Justice Coalition. Honda has often said that he took the lead on the comfort women issue because “it’s the right thing to do…I think that Abe may be letting his personal feelings get mixed up in these historical issues. Japan’s political history overlaps with his personal history, since both his maternal grandfather Nobusuke Kishi and Kishi’s brother Eisaku Sato served as prime ministers,” Honda said. Lowe, a Chinese-American who spent 20 years as the aide to Dianne Feinstein (former mayor of San Francisco and chair of the US Senate Intelligence Committee), says that the Japanese government’s problematic treatment of the comfort women issue began in the 1980s. “That’s when the Japanese government started pouring millions of dollars into a lobbying campaign aimed at American scholars and researchers. Since the majority of whites aren’t aware of this, they’re confused by the claims of the Japanese government and the findings of fact-based researchers. The question is, how do we effectively deal with the Japanese government’s cash-rich scheme to disrupt efforts to bring the truth of the comfort women issue to the attention of the American public,” Lowe said. “There are very old and stubborn anti-Asian feelings in the American political world,” said Honda, whose family was among the victims of the US government’s forced internment of Japanese-Americans during World War II. “As I was growing up, I found myself thinking that the prejudice and the discriminatory behavior of mainstream whites against Asians was ultimately a way for the majority to isolate and control a minority. Minorities like us are faithful not to the regime but to the constitution. The freedom of political activity that is enshrined in the constitution is very important. The US is a fine country, but it’s not a perfect one. That’s why I’ve diligently participated in political activity to realize and protect our constitutional rights.” Honda’s activism for the comfort women is an extension of that. Lowe also criticized US policies that apply different standards to Japan and to South Korea. “The fact is that South Korea is being treated unfairly because the US has double standards. Americans don’t understand why Koreans are angry and what Japanese are secretly aiming for. In that sense, perhaps we should regard the US as angling for its own political and economic interests while manipulating South Korea and Japan as puppets,” he said. This page was last modified on 28 January 2019, at 21:53.